The fourth largest city in Austria is one of the best preserved cities north of the Alps. Visitors love the charming center, baroque architecture, views of the mountains, and culture hugely influenced by Salzburg’s being the birthplace of Mozart. Running in Salzburg is a pleasure, with paths along the Salzach River, and two small mountains right in the city. The setting becomes pastoral only a few kilometers from the city center. 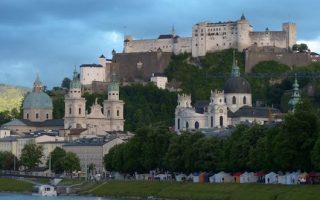 We’ve put together a ‘runseeing’ tour of Salzburg, including the path to Mönchsberg and to the Fortress. 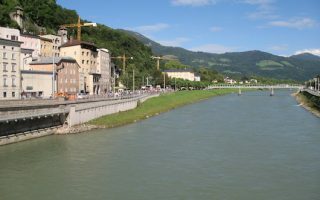 The Salzach River offers many km of running trails. Another highlight is the Hellbrunner Allee, a path that leads to the beautiful grounds of the Hellbrun Palace. There’s also some exciting trail running in Kapuzinerberg, and a gorgeous but challenging circuit around Gaisburg Mountain, only a few km from Salzburg. Salzburg is very compact, so all of our routes are easily accessible from the city center. The city has a good bus system, but to explore Gaisburg or the nearby mountains, a car is needed. Among the highlights of running in Salzburg. Combination of paved and unpaved paths, for several km north and south of the city. Quite pastoral, with river views. We've put together two routes, as well as a table with segment distances. A run along up a pedestrian path to Mönchsberg, one of the 5 mountains in Salzburg. 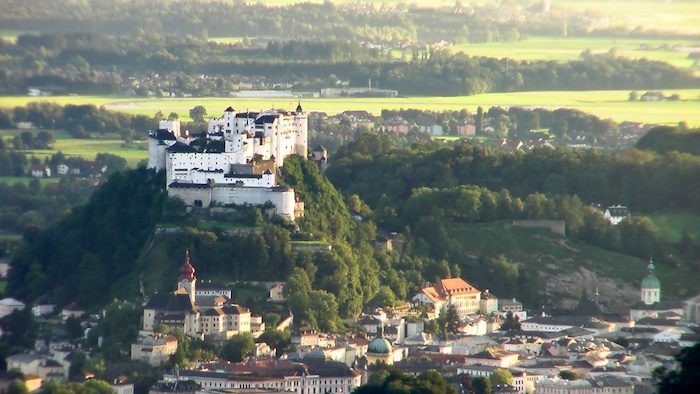 Enjoy hilltop views from the 11th century Hohensalzburg Fortress. Also includes some of Salzburg's architectural and cultural highlights. A gorgeous, pastoral run out to the 17th century Hellburn Palace, famous for its grounds. To approach the palace, you'll run for 4 km along tree-lined Hellbrunner Allee, a paved and gravel pedestrian path, passing farms and interesting buildings. 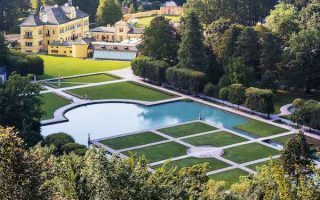 For a nice and relatively flat run near the center of Salzburg, enjoy our 'parks and lakes' tour. 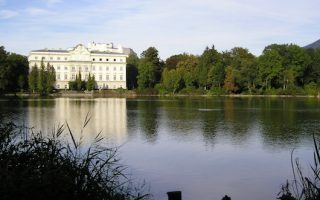 2 km lake perimeter, Hans Donnenberg Park, Botanical Gardens, historic Schloss Freisaal Palace. Kapuzinerberg is the other hill close to Salzburg city center, and a popular recreation spot. It's a steeper, more rugged run/hike, climbing 200m in 1.3 km. Mainly wooded paths, it's 2.8 km from one end to the other. Can be combined with other routes. HILLY! 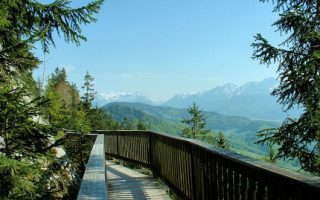 The "balcony of Salzburg" is a 5.2 km circuit around the mid-point of this 2,600 foot mountain only a few km from the city. Hilly and beautiful, with great views! If you'd like to tackle the summit, it's 2.3 km from the hotel, super steep! Owing to its location at the foothills of the Alps, Salzburg has colder winters with more snow, but very pleasant, mild summers. In summer, average high temperatures are in the 24C (75F) range, with cool nights. Bring a layer at any time of year! Fall is gorgeous and lingers into late October/early November. Winters are cold but not frigid, with average high temperatures above freezing — 3C (40F) — and nights dipping into the 20sF (-4C). 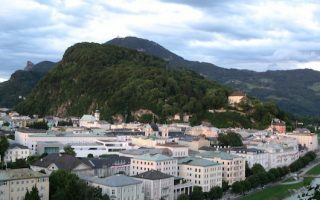 Salzburg receives about 112 cm (50 inches) of snow annually. Rain in summer comes often in the form of thunderstorms. Bring layers at all times of year, and be aware that footing might be a challenge in winter. Note that some of our mountain trails might be snow covered in winter. Salzburg has a good selection of hotels an inns at various price ranges. They tend to be clustered on the eastern side of the river. We recommend staying within 1-2 km of the river, so inside (to the west of) the major Road 150 and south of the A1.